There are haute couture fashion shows happening twice a year, once presenting their spring and summer numbers and once parading on that catwalk the fall and winter collections. They are strange over half the time, and even when they seem like something you would actually want to wear, the occasion for it is not very likely to come up. Of course, that does not include certain designer lines like Chanel, where those suits are definitely garments you can don more than once in a lifetime. An Elie Saab wedding dress though? Let’s hope that marriage lasts a lifetime, for it is a dream that brought it into creation. A Zuhair Murad piece would also fit that ticket. As such, it’s no wonder that most of these pieces are only seen on the runways. Of course, there is always the price to consider. But what exactly is haute couture fashion and how much does haute couture cost? The term haute couture is French by origin and means “high’ or “elegant’ sewn pieces. It has become the perfect embodiment of fashion designs that are made specifically for an individual and hand sewn to perfection. It is the business of literally designing, creating and selling custom-made high fashion women’s attire. Traced back to the court of Louis XVI and Marie Antoinette, the art of sewing fashion garments was very much held in esteem. It was an Englishman in 1858, who opened his designer atelier in Paris and brought the term to light, however. His name was Charles Worth and he ended up founding the Chambre Syndical de la Couture Parisienne, a commission that would control the world of haute couture from that day forward. 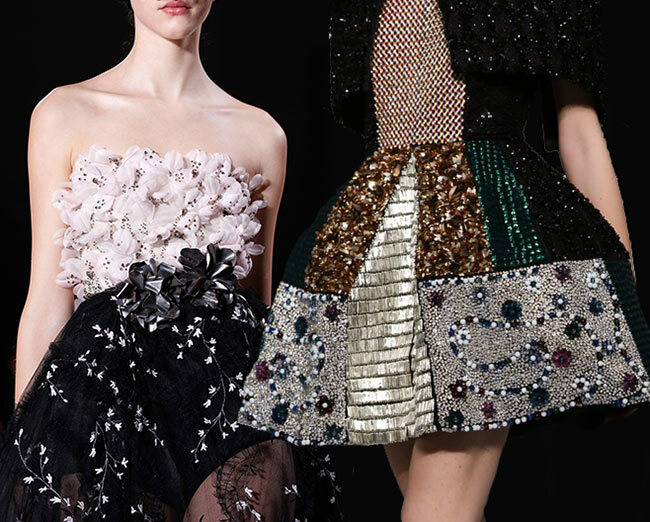 It is still the governing body of haute couture designers today. Regulated by the French Department of Industry in today’s world, a business must belong to the Chamre Syndical, employ 15 or more people and present their collections twice a year. Each presentation is expected to include at least 35 separate outfits for day and eveningwear. This form of fashionable art continued well into the days of World War II, even when fabric rations were in effect and costs were cut by using dolls instead of models. It trudged through though and the importance of keeping up the craft was proven by the fact that before the war started, there were 35,000 people who were employed by couture courses. Currently there are about 23 members in the Chambre Syndical de la Couture Parisienne, including Coco Chanel, Christian Dior, Pierre Cardin, Elie Saab, Rad Hourani, Zuhair Murad, Giambattista Valli, Versace, Jean Paul Gaultier, and Valentino, among others. Each of the houses generates over $1 billion in annual sales, while employing over 5,000 workers each. Each employee has his or her own specialty, whether it be buttons, feathers, fabrics, shoes or other such details. While most members are of French or Italian origin, we have seen some from the Middle East also enter the haute couture market, creating pieces that are breathtakingly gorgeous. Not all fashion houses with haute couture collections are part of the Chambre Syndicale in the last few years, particularly Dolce & Gabbana and Gucci. Since the niche has often been predicted to die out soon enough, it is rather important to keep evolving and changing the rules of the game. Furthermore, the inclusion of fresh new minds like Elie Saab and Zuhair Murad have breathed life into the haute couture fashion industry and, with their ascend into the ranks of the elite, have brought new customers with them. Saab alone has created the wardrobes for over 10 members of royal families, bringing new wealth to the world of haute couture. Even if we were to mortgage our homes, the price of a simple gown off the haute couture Paris Fashion Week runway is bound to break the bank by a few hundred thousand. Considering the fact that each piece is handmade and can take up to and even over 800 hours to complete, with the usual number about 100-400 hours, it certainly is no wonder that even the simpler daywear does not come cheap. Whereas those may start from around $10,000 and rise with the fabric used, the embroidery put in, the designs and the hours of labour taken into consideration. A tailored suit may cost you $16,000, while a simple evening gown may go for over $60,000. For an intricate gown with heavy embroidery, you are looking at a few hundred thousand, while some pieces can even range up to $10 million, especially if they are diamond encrusted and mind blowing in epic design. The sky really is the limit and that means you spend as much as you’d like to receive a gown that befits your place in the world. See also:	Have Fashion Trends Died Or Are Fashion Trends Still Trendy? Of course, haute couture pieces, as expensive as they may be, do not sell enough to cover the needs of a fashion house. Instead, it is the smaller ready-to-wear pieces, the accessories, the perfume and the cosmetics that eventually bring in the money. That makes perfect sense since the number of people who can afford to pay an average individual’s annual salary or couple of years’ worth of salaries on a single gown are so few, they can be counted on your fingers. In the 1950s, society ladies like Babe Paley, Marella Agnelli and Grace Kelly were top couture customers, while the couture poster women during the ’70s and ’80s were Nan Kempner, Lynn Wyatt, and Rosie Rosekrans. However, come the ’90s and suddenly we had Middle Eastern women like Kuwaiti socialite Mouna al-Ayoub vocalizing a certain love for haute couture fashions. Today, the main markets of haute couture fashion are from the Middle East, China, or Russia; this is, of course, outside the American models and actresses who have turned to this form of fashion for their glamorous parties and red carpet affairs. There are only about 4,000 women in the world, who can afford to make such extravagant purchases, while it’s not uncommon for designers to loan out certain pieces to the stars and public figures in order to gain publicity. In the 1950s, however, there were about 15,000 women who would turn to haute couture for their luxury pieces. Now, the craft is kept partly because it’s so good and partly because the haute couture designs actually help sell the rest of the products available by that fashion house. It is a fashion phenomenon to seriously be enjoyed, especially when we have access to photos and often live feeds from the Paris fashion shows.